Sohrab Homi Fracis (“Fray-sis”) is the first Asian writer to win the prestigious Iowa Short Fiction Award. He received it in 2001 for his collection of short stories, Ticket to Minto: Stories of India and America, published by University of Iowa Press. He resisted advice from publishers to combine the thematically related stories into a single novel, which they thought would be easier to sell. Fracis believed passionately that the stories stood strong and worked best as they were. “And I was proven correct,” he says. Sohrab is currently writing a novel called Go Home, which he says he has been pitching to publishers as “Jhumpa Lahiri’s The Namesake meets Kerouac’s On the Road”. An excerpt from the novel, published in Slice Magazine, was nominated for a 2010 Pushcart Prize. Another excerpt appeared in South Asian Review. Sohrab Homi Fracis was born in Mumbai (then called Bombay), India. He first studied engineering, then computer programming, then became a systems analyst, which brought him to the United States. He went back to school for an M.A. in English and creative writing at the University of North Florida in Jacksonville. He taught literature and creative writing at this college from 1993 to 2003, and is now retired from teaching except for his participation as an Instructor for the annual University of North Florida Writers Conference. 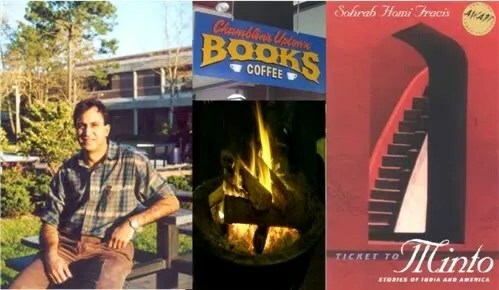 A few months ago, I went to an open-mic prose and poetry reading at one of Jacksonville’s most popular independent bookstores, Chamblin’s Uptown. At that time, I knew nothing of Sohrab and his awards, but his reading of a selection from Ticket To Minto motivated me to buy the book. I enjoyed every story, and a couple of months later attended the UNF Writer’s Conference. I didn’t want to wait another year to ask him questions, so I arranged to interview Sohrab for Literary Kicks. Bill: The ending of your book’s title story, “Ticket to Minto”, left me unsure as to how I felt about the aggressive actions of the Mintoan students. The uncertainty was a not altogether unpleasant, but rather felt akin to the enthusiasm I felt as a teenager for movie anti-heroes like motorcycle gangs and western gunfighters. Did you intend to elicit this feeling? Sohrab: I didn’t mean to portray the Mintoans as anti-heroes (though I’m fine with your reading/experiencing/enjoying them that way), so much as almost ridiculously complex men: excessively polite and generous under certain circumstances, but crude and murderously violent under others. As a result, the story’s narrator is ambivalent about them, and in conveying the story through his perceptions, I do intentionally impart that ambivalence to the reader and a strong sense of their complexity. At roughly midpoint of the story, the reminiscing narrator says of the Mintoans, “Something in me has always said that if I could understand them, I could understand myself; if I could understand them, I could understand our country in all its callow bombast and hoary wisdom; if I could understand them, I could understand the world.” He’s getting at that wide-ranging complexity in the central clause, and extending it to all of us. Underneath our socially constructed veneers, we’re genetically and biochemically complex creatures, capable of a wide range of characteristics in response to the relevant stimuli (short-term and long-term). I used to say to my lit students at University of North Florida: “Show me someone you think is ‘a simple man,’ and I’ll show you that still waters run deep. Show me someone who thinks of himself as a simple man, and I’ll show you someone who’s deluding himself.” That goes for women too, of course; I was just bouncing off the commonly used phrase. Bill: What are some projects you worked on as a computer programmer? Bill: Does India have any fiction genres not found in America, or conversely, are there genres in America that you rarely or never find in India? fiction ground easily referenced in any conversation or story, as in my story “Matters of Balance,” which plays off the Mahabharata. Also, there’s Indian fiction in various indigenous languages: Hindi, Bengali, Gujarati, Tamil, etc. In Campion School we read some Hindi stories as well as English, though mostly the latter. I believe that early multilingual experience helped my writing ear. There again, most of America reads and writes in only one language, English. I think experimental fiction, where form takes priority over content, may be a genre as yet unexplored in Indian fiction. But it seems to be a dead or dying genre, now. Bill: How do you see the role of literature in bridging gaps between different cultures? Sohrab: It’s hard to tell the degree to which it does that, without a study through surveys, etc. Clearly, it has done so to some degree, and continues to do so, but I think the way it does that has been undergoing a change. Used to be that, wherever we were from, we’d come to know about, say, the Russian or French cultures through reading their respective stories, often in translation, about Russians interacting with other Russians in Russia or the French interacting with other French men and women in France. And they in turn would read stories about us interacting with our fellow Americans or Indians or Englishmen, as the case may be, and they’d learn about our cultures that way. So the literature wasn’t about characters bridging cultures, just about characters immersed in separate cultures. Whereas now, more and more, we have international or global or, as I like to call it, cross-national stories about, say, Jamaicans and Pakistanis interacting with Englishmen in England, as in Zadie Smith’s White Teeth. And the multinational characters are themselves in the process of trying to bridge the cultural gaps between one another. collection is “Stories of India and America,” reflecting an alternation between the two countries all the way. The novel I’ve been working on, Go Home, which gets its name from a phrase yelled at foreigners in the aftermath of the Iran hostage crisis, features an Indian character of Persian origin in America searching for his place in the world. It would be interesting to track the roots of this expansive international literature: colonial literature, such as E. M. Forster’s work, expat writing, such as Hemingway’s, and postcolonial lit, such as V. S. Naipaul’s and Jamaica Kincaid’s, all come to mind. Of course, war stories, inherently cross-national, go back all the way to the ancient epics: Greek, Persian, Indian, Irish, British. But they weren’t exactly bridging cultures. Bill: How did you receive the “Most Beautiful Books” award? Sohrab: When my book’s German translation, Fahrschein bis Minto, was released at the Frankfurt Book Fair in 2006, it was selected to a list of fifty “Most Beautiful Books” of the year. As far as I know, that was quite literally meant as an award for the artwork and design of the German edition at Mitteldeutscher Press, not anything to do with the book’s content. Funny story, though: the cover design etc. at first had been quite different, more humorous than artistic, to go with a new title they’d envisioned: Minto Hostel. Apparently, that was meant to ride the wave of popularity of a movie called Hostel. But when I explained to my translator-editor Thomas Loschner at Mitteldeutscher that Ticket to Minto functioned as a metaphor for the reader’s passage to a destination straddling East and West, they went back to the original title and redesigned the cover. Bill: What was it like reading at the Zoroastrian Association in Houston, Texas? What year was that? great questions and signed a bunch of copies. All of that, and I got to see a great new city too. Bill: You write about tennis players — do you still play? Have you won any tennis championships? FEZANA (Federation of Zoroastrian Associations of North America) Journal. As I wrote in there, “it enriched my life,” and “my stories would reflect [my father’s] love for sports, a love he passed on to me.” Though only peripheral to a few stories, sport was a rich field to mine for metaphors about the game of life. Sohrab Homi Fracis (“Fray-sis”) is the first Asian writer to win the prestigious Iowa Short Fiction Award. He received it in 2001 for his collection of short stories, Ticket to Minto: Stories of India and America . He resisted advice from publishers to combine the thematically related stories into a single novel, which they thought would be easier to sell. Fracis believed passionately that the stories stood strong and worked best as they were. Left: Sohrab Homi Fracis at the University of North Florida. His book, Ticket To Minto, won the Iowa Short Fiction Award in 2001. A few months ago I pondered the origins of a little-known book called No Heaven For Gunga Din by Ali Mirdrekvandi, who may or may not have really lived. 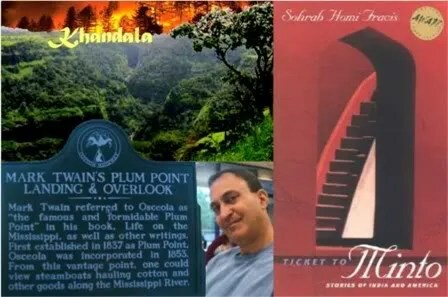 I recently got some additional insight into that subject from Sohrab Homi Fracis, who I met Wednesday night at the monthly poetry reading at Chamblin’s Uptown here in Jacksonville, FL (while it’s called a poetry reading, group leader Janice Best allows us prose writers to read excerpts from our books). First, let me tell you about Sohrab and his excellent book, Ticket To Minto (2001, Universityof Iowa Press). The chapter he read that night at Chamblin’s was so entertaining and compelling, I knew I had to read the rest of the book. I was in luck – Chamblin’s had one more copy in stock, so I bought it. I think they’ve ordered more. The first story, Ancient Fire, reminds me of a chapter my own book, Tamper, called The Boy Who Hid In Leaves, in that they both invlove bonfires, bullies, and a youngster coming of age in a sometimes hostile world. Pesi, the boy in Fracis’ book, lives in India. Whit, the boy in Tamper, lives near the Appalachin Mountains of Virginia. But even though they were born and raised on opposite sides of the worls, these kids have more in common than they have differences. I was moved to look up “fire symbolism in literature” and the first thing I found was a discussion of Lord of the Flies. But in contrast to Lord of the Flies, the scenario in Ticket To Minto does not devolve into anarchy. The world is still held together by the guidance of adults. Even though Pesi’s parents (especially his mother) might sometimes embarrass him, he knows they will be there for him. Good parents here on Earth make it easier to believe in truly good deities who will protect you when the parents are not around. I found this part of the story very comforting and true-to-life. I could relate to it. This brings us back to the topic I mentioned at the beginning of this article. I sent an email to Sohrab, asking him if he had ever heard of Ali Mirdrekvandi or the book No Heaven For Gunga Din. Sorhab replied thoughtfully, “No, I haven’t heard of that book, but it sounds very interesting. Its storyline reminds me of a favorite story of mine by another British author who wrote about India: E. M. Forster’s Mr. Andrews. I think it’s pretty likely that, whoever the author of No Heaven for Gunga Din was, he’d read Forster’s story and was inspired by it (as, perhaps, were the countless “St. Peter at the Pearly Gates” jokes). Read it on this online link and judge for yourself: http://www.daily-pulp.com/literature/mr-andrews/. So, I want to thank Mr. Sohrab Homi Fracis for the above link to the complete text of Mr. Andrews by E. M. Forster, and also for writing such a great book, Ticket To Minto.